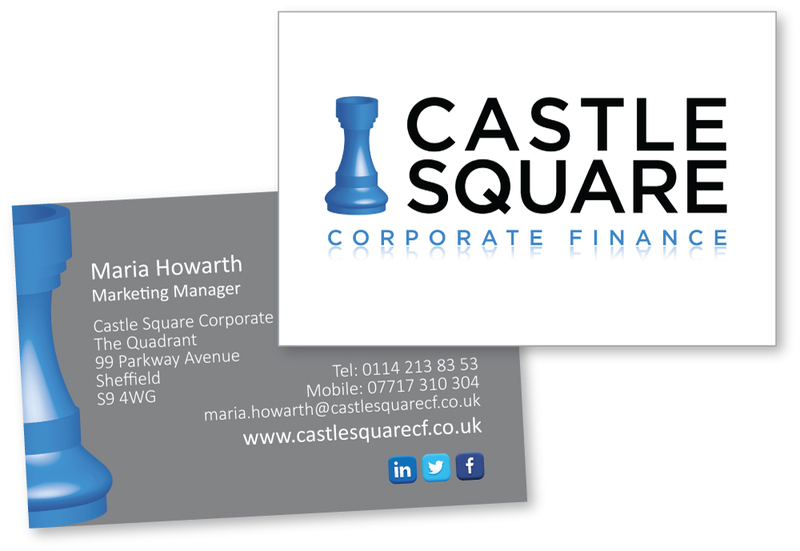 In 2016, the team at Castle Square Corporate Finance in Sheffield felt they wanted step up their marketing approach and update their image, and they called in CQ Strategic Marketing to help. They asked us to look at a number of activities, including refreshing their logo and literature to give a more contemporary feel. I began by looking at their original brand identity, and discussed a number of ideas and options, including what they were happy to lose, and what they wanted to retain. Marketing Manager Maria Howarth led the rebrand work, and told us the firm were keen to keep the colour scheme and the chess piece from their original marque to maintain customer familiarity and recognition, but felt that the look was dated and needed a boost. I worked with Maria on a range of different designs, utilising the black and blue scheme, and the chess theme - both as a standalone ‘castle’ chess piece, and also as variations on a chessboard motif. Maria also stressed they wanted a logo which looked contemporary but still solid, stable and strong, which was achieved using our final choice of font. These options were narrowed down until the final design was selected, as shown here, depicting a stylised 3D blue chess piece, with block uppercase text. Once approved, we were able to roll this new design out across Castle Square’s corporate stationery, business cards, social media profiles and new website. The following year, I used the new branding to design both exhibition banners and a brochure folder with insert sheets on services, product information and case studies. This offered the flexibility they wanted to target the most appropriate information to their clients as required. We incorporated some beautiful stock imagery to add interest and context.